This one has definitely grown on me. I first came across the product in the Finding Mr Bright gift set that I was given for Christmas. I was already using the Girl Meets Pearl and High Beam highlighters, but I wasn’t so taken with this stain. I was put off by the neon colour and strange consistency, somewhere between a tacky gloss and a liquid. Benefit market this product as a stain for both lips and cheeks. I still wouldn’t use it for my lips, as it makes no noticeable difference when applied other than to make my mouth feel wet – and even that passes quickly. But when I ran out of my usual cheek tint in a busy week I started using this as being better than nothing for the time being. I warmed to the colour, it gives a nice, girly-pink flush. I don’t think it’s quite the natural look, but subtle enough, and nowhere near the night-at-the-roller-disco that I’d feared when I first opened the tiny bottle. It’s quick and easy to apply. A couple of dots on either cheek that you then pat in until it’s dry. And that’s it. The one thing I’ll give this product full marks on is that stays put all day. I’ve never needed to top it up before bed time, a thing that’s been a real bug bear with various other liquid or powder stains that I’ve used in the past. The full size version initially looked a bit pricey £24.50 for just 12.5ml, but considering how little you need to use in one application those 12.5ml will pretty much last you forever, or at least until you’ve got bored and moved on to new look. All in all a pretty solid effort. Tags: Benefit, Cheek Stain, Cosmetics, Posietint. Bookmark the permalink. I used the red benefit stain at one point and, sadly, it did not work well for lips. It came of in roughly 2 seconds. 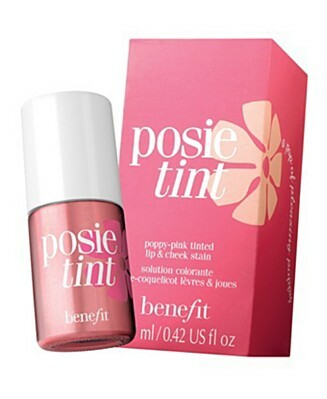 I definitely like the Posietint better and it seemed like the formula was thicker than the redder version so it made for a good lip and cheek stain for me. Lip stains in general have disappointed me a lot. I feel like the color is rarely what I wanted and then I have trouble applying it evenly or making it stay on. Oh and I’ve been meaning to tell you, I think the name of your blog is pretty fabulous! I’ve never tried the red one on my lips, thought it was alright on my cheeks. Lasted better than expected considering it looked a lot like red food colouring. I’ve had pretty much the same experience. I think it’s probably not possible to make a product that will work really well on your skin and your lips. Too different. And thank you! I spent ages trying to think of something alliterative.